Last night at approx 7.30 (local time) the Minister broke the surface of Okanagan Lake in yet another of his world famous HopArt-jumps. The North-American HopArt Tour of 2007 is ongoing and the latest jump was a success outside Rose’s Bar in Kelowna. 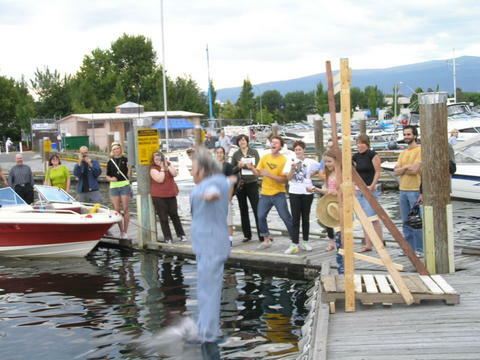 The locals cheered on when the Minister made his jump into the Okanagan Lake of British Columbia. The protest jump was a success and the list of protests was extended by the Kelownians. Things like “Traffic on Bridge” (local phenomena), American Cheries, Bad Spelling, mosquito bites and gum under shoes was added. Minister going into Okanagan Lake, British Columbia. Photo credit: Bill Poulin. 7.00 pm Opening presentation, Alternator Gallery (Rotary Arts Center). 7.30 pm (approx) HopArt performance Waterfront Park, Kelowna (by the water outside Rose’s Bar). 8.00 pm (approx) Presentation and screening of video “ARCHIVE – Eslov By The Sea”. Documentary-style historic art research project about the unknown history of the little town of Eslov (south Sweden) that once was the cultural hub of the western hemisphere. Eslov is the town where the bikini, fashion, boardwalks, Champagne and much more originally was invented, and also the place the Eiffel-tower originally was intended for. Tomorrow (June 28) a HopArt jump is being performed in Kelowna. Jump is planned for 7 p.m. (local time) and later on in the evening a presentation of and by the artist is planned at The Alternator Gallery for Contemporary Art. Please contact the Gallery for further information. You can read a short article and see some pictures in the Ladonian Herald today. The Minister of Art & Jump also acting Cultural AttachÃ© and Special Envoy of Ladonia, Fredrik Axwik, is visiting British Columbia – the Vancouver-area and the Okanagan Valley. Mr. Axwik is visiting Canada for the first time and he’s staying in Vancouver and Okanagan Valley due to a artistic HopArt-tour. The HopArt-tour is an artistic performance (The Minister is also a contemporary artist in Sweden, where he lives). HopArt is a performance that Mr. Axwik has been doing for several years, in Sweden and Scandinavia. This is the first time in North-America. The Minister of Art & Jump has already performed in Vancouver, on June 20, hosted by the renowned 536Arts Collective (est. 2000) that exists at 536 E 20th Ave in Vancouver. The Minister will also perform his HopArt in Kelowna on June 28 at “The Alternator Gallery of Contemporary Art”. The HopArt-jump will take place by (into) the water in the middle of the town and there will also be a presentation of and by the artist and his project/s before and after the Jump. The jump is performed as a protest against the order of things. The Minister has a very extensive list of protests and anyone that has anything they like to add to the list can do so before the jump. The Minister then takes their problems on his shoulders and jump into the water and thereby solving the problems. The world is different after the jump when the Minister emerges from the water and after the protest is completed. The Minister of Art says that he likes to hear that other Europeans [Mr. Schwarzenegger is from Austria – editors note] lives in the area, and that he [the Minister] has a very good manuscript for a film that he would like to show to Arnold. “I bet he never heard that before” says a very smug Minister. “The film would of course be shot on location in British Columbia” says the Minister. “In fact I’m ready to challenge Mr. Schwarzenegger to see if he’s worthy of the script. It is an impressive Champion Canada has to compete for them” says a very impressed Minister. 5. Jumping with both feet’s together. “I’m really doing this for the people rather than for myself” says the Minister in a closing statement. The event will take place at the Alternator Gallery for Contemporary Art, an artist-run centre located in the Rotary Centre for the Arts at 421 Cawston Ave. in Kelowna, BC. Admission is by donation. Call (250) 868-2298, visit or e-mail info@alternatorgallery.com for information. HopArt in Vancouver – a small jump for the Minister a giant leap for the Art-world. Photo: Patrick Chan. The jump in Vancouver went nice and I came up from the water. We couldnâ€™t make a jump into the waters of the Pacific thoughâ€¦ still, thereâ€™s a jump planned for Victoria in a couple of weeks and we might be able to tick off the Pacific Ocean on the list over water jumped into. We also look forward to a jump in Kelowna in about a week (June 28). Ministeriet gratulerar dagens enda namnsdagsbarn som Ã¤r Linda. Spanskt smeknamn fÃ¶r Belinda som betyder vek, spÃ¤d. Linda hade tidigare namnsdag 3/12. Namnet Ã¤r en kortform fÃ¶r Belinda, Rosalinda och liknande namn. Slutleden anses ha sitt ursprung i ordet “lind” som kan Ã¶versÃ¤ttas med mjuk och spÃ¤d. I Sverige Ã¤r Linda tidigast dokumenterat som namn pÃ¥ 1830-talet. Det blev inte speciellt populÃ¤rt fÃ¶rrÃ¤n under de senaste decennierna. Idag Ã¤r antalet Linda omkring 45 000. Ministeriet gratulerar dock inte Linda Skugge, Expressens uppblÃ¥sta “Blogg-drottning”, som enbart kan betecknas vara en navelskÃ¥dande sjÃ¤lvcentrerad bitter-hmhm med sjÃ¤lvinsikt i trÃ¶skelhÃ¶jd och som sÃ¤ljer in sig sjÃ¤lv med att inte gÃ¥ pÃ¥ premiÃ¤rer o.dyl utan gÃ¥r in fÃ¶r en slags retro-diskbÃ¤nksrealism. TyvÃ¤rr lÃ¤mnar den mycket i Ã¶vrigt att Ã¶nska. Hennes litterÃ¤ra karriÃ¤r kan bara skrivas av pÃ¥ kontot “kÃ¤nd fÃ¶r att vara kÃ¤nd”. You are currently browsing the Ministry Blog weblog archives for June, 2007.